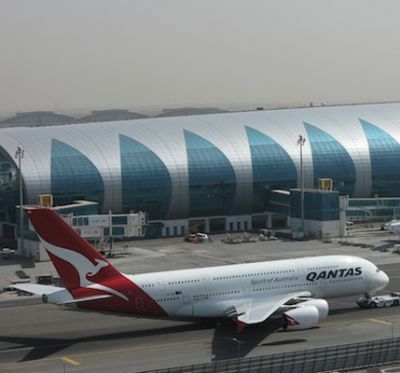 Regular users of Qantas flights between London’s Heathrow and both Melbourne and Sydney have been experiencing changes over the last few weeks. From the start of April Singapore has not been the mid-journey break point but Dubai following the carrier’s break from its British Airways’ partnership and a new alliance with Emirates. Qantas has always been a popular carrier with the type of passenger who enjoys the spirited quality cabin service that the airline offers. With Emirates the service, whilst just as good, is perhaps a little less personal and more staid. With the new arrangements there are differences. If you want a pork meal or bacon for breakfast that is now a no-go due to Moslem dietary requirements. No alcohol is used in the food preparation. However, just like Emirates, the airline is far from a dry carrier, Fosters is available, plus a fine liquor trolley with plenty to send you asleep. Qantas has a tremendous reputation when it comes to a quality wine selection and this has improved if anything. Qantas customers in both ‘up front’ classes now have the benefit of a chauffeur service to and from the airport and can use the Emirates A380 purpose-built lounge at Heathrow, one of the best at the airport. The biggest change of course is the flight times for the two sectors. From Heathrow to Dubai both services are in the evening, daily, with arrival around seven hours later with the sun coming up. In practical terms this means that most passengers will eat on the ground using the large Emirates restaurant with its fine selection of both hot and cold meals. (see www.btnews.co.uk/article/5989). In the other direction it is the same. Early morning flights with arrival first thing. Unlike with the previous stopover, at Singapore, now it is the second leg that is the longest (13hrs 50mins) but the total travel time to Oz has been reduced by 30 minutes. The London – Dubai sector is crewed out of Heathrow and the base staff think the new arrangement wonderful, just about half the working time from previously. We’ve not been able to ask the Oz based crews! Working on an aircraft for 14 hours plus is a long time. Staff bunks at the rear are provided. With both Emirates and Qantas the Business Class cabin is on the upper deck, but for the Australian layout the back of the aircraft is given over to a Premium Economy product (on the latest delivered machine ex-Toulouse offers Economy too) and First Class is on the main deck. Qantas has the Business Class galley in the centre of the upper deck, which makes for great efficiency and not too large a cabin. No bar as such is offered (there is a self-service lounge in the very front of the aircraft) unlike Emirates which has the best flying watering hole to date. It makes the Virgin in-flight drinking area look puny. However with Emirates the Business Class cabin is very long and large. It is quite a trip to the front seats from the food preparation area. Emirates also has First Class in rows 1-4, complete with showers. 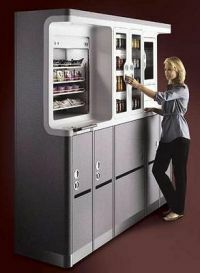 On boarding Qantas your outer garbs are placed in a wardrobe and soft drinks supplied. You are also offered a sleeping suit. This is something that does not come with the Emirates product, the other big apparent difference being the supply of a thin mattress by Qantas, the 80” flat bed seat being one of the most comfortable yet thought up. The seat itself is much wider (21.5”) than what is now the sister company (18”) and your feet do not slot under the seat in front. However unless you have the window allocation there is very little space to put anything. The big advantage of being able to look out is nullified by the fact that the seats are strictly 2+2+2. Rather like on Lufthansa if you are by the window you do have to manoeuvre over your fellow passenger if in the sleep position. With Emirates graduated layout means that this will never happen. With the Dubai carrier there is plenty of space for whatever you have brought with you and whilst an earlier design, it does seem more modern. But big people will find the seats tight. When it comes to food preparation and service Qantas is up there with the best with a fine and varied four-course menu. The real pity is to Dubai the flight is too short and at the wrong time if you enjoy dining on an aircraft. On the return leg a lovely breakfast is served if you wish to be woken, but even here it is slightly rushed as the cabin crew have one eye on the clock for landing. One thing is for sure early in the morning Heathrow is quiet and the Border Control a mere formality. The Qantas screens, on an arm (12”), are not as large as the Emirates (17”) back of seat product (a stretch) and the table is of the fold up variety rather than a single flat piece. The film selection on both carriers is excellent but with Qantas there is an emphasis on sport, as you would expect with an Australian carrier. The fares on the route are common-rated price wise. Rather like Air New Zealand (our favourite operator to Los Angeles), Qantas is likely to pick up quite a lot of business in the future from passengers not going through to Oz, and either getting off at Dubai, or using the new Concourse A before joining an Emirates flight to their final destination. With the new Emirates relationship comes a new uniform – the work of acclaimed Australian designer Martin Grant. From early 2014 it will be worn by all 12,600 uniformed employees. Qantas Group CEO Alan Joyce said that he was proud to launch the first new design for the airline in ten years. "This is a new look for a new chapter for Qantas”, he said. Martin has designed 35 elegant garments for female and male employees. Against French navy suiting and white shirting, variations of the Qantas red – ruby red and fuchsia pink – are featured in diagonal stripes, recreating the idea of the Qantas triangle, across tops and dresses for women and on ties for men. Female employees will wear a combination of a dress, tops, a suit and a trench overcoat, accompanied by a stylish scarf and a trilby hat in a knitted fabric made from recycled bottle tops. The male suiting is neat and structured. The range has been designed for high levels of comfort to suit a range of different work environments and climates.